As a woman who embraces all seasons (yes – even winter), I have none the less been ready for spring. After snow and 20 degree temperatures last week, Spring may finally have arrived in Southwest Virginia this week. Hurray!! I hope the freezing temps are gone for the year, and I’m sending warm thoughts to those of you who are still hoping for Spring. This entry was posted in Flowers, Photography, Spring, Trees and tagged Flowering Dogwood, Spring, Tree Planting, Tulips, Virginia State Tree. Bookmark the permalink. Thank you! 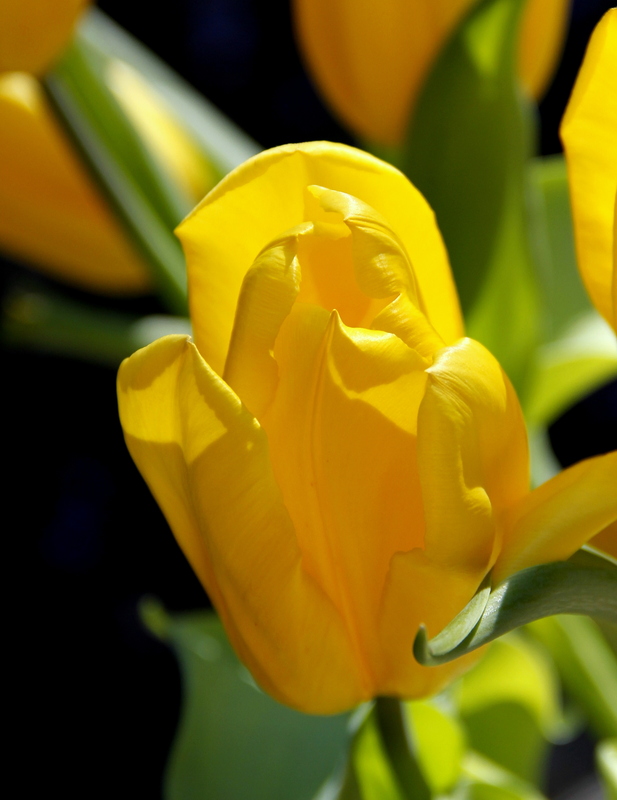 Yellow is such a wonderful color and these tulips just made me smile … and almost made up for the fact that I didn’t get to have an Easter Hunt 🙂 Next time, I’m coming to your place!! 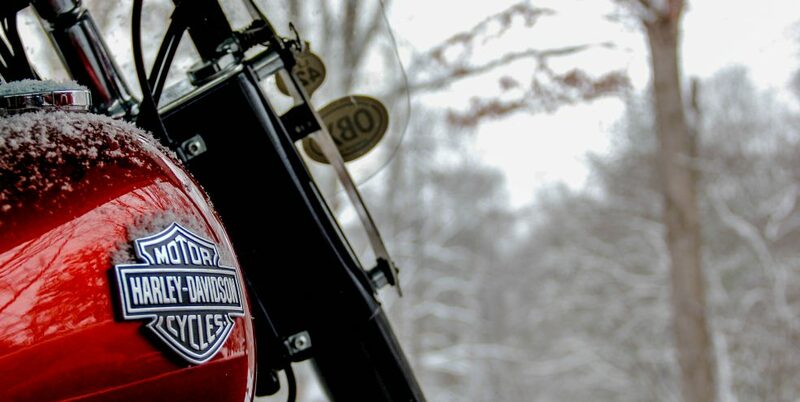 Can’t think of a better way to start off the work week than with these pictures. Here in Wisconsin we’re a bit behind you, so thank you for sending me spring flowers. You are so welcome! Hoping the warmth and flowers come to you soon! Yes, I believe it is spring! I love Dogwoods. Enjoy! I’m watching the tree like a mother would a child 🙂 So excited!! Yes, I do believe we have completed the transition here, too. The tulips are definitely up (at least the ones the critters haven’t attacked underground over the winter!!!) and the rhubarb will be ready very shortly!!! The asparagus patch is cleared off and ready for the Spring warmth to work its magic. Nicely warm and showers til afternoon then sun. I so love Spring!!!!!! Your photos are stunning!!!! (as always) Hugs……….. I love rhubarb!! and asparagus, too. I’m so very glad you finally have warmth after the terribly long and cold winter. Sigh…….me, too!!!! Bed linens headed for the washer and then out to the clotheslines!!!!! Yay!!!!! Have an awesome day!!!!! I’m learning something new everyday. I saw my first Dogwood up close two weekends ago. They’re gorgeous. How wonderful for you to have them growing wild in your neighborhood, and now you have your very own up close for your enjoyment. 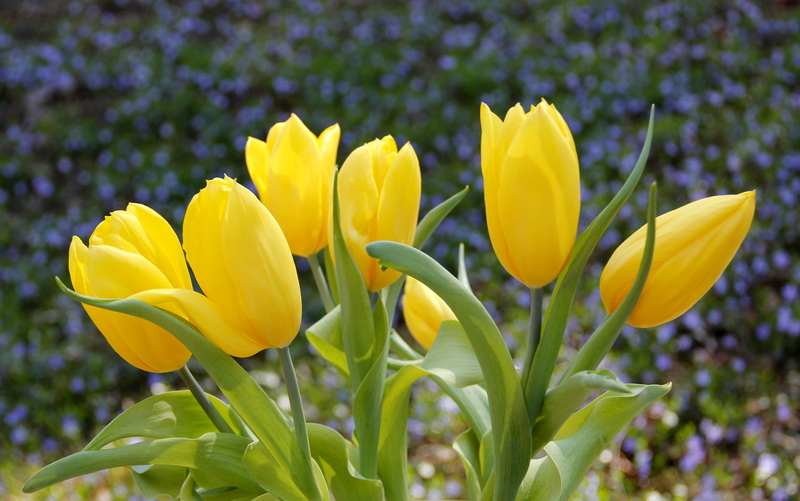 The yellow tulips continue to enthrall. I’m so glad spring finally arrived. I’m so excited about the tree, and am watching over my little dogwood like a mother would. Wonder if it will flower this year? I planted a Redbud 6 years ago and it has grown beautifully. 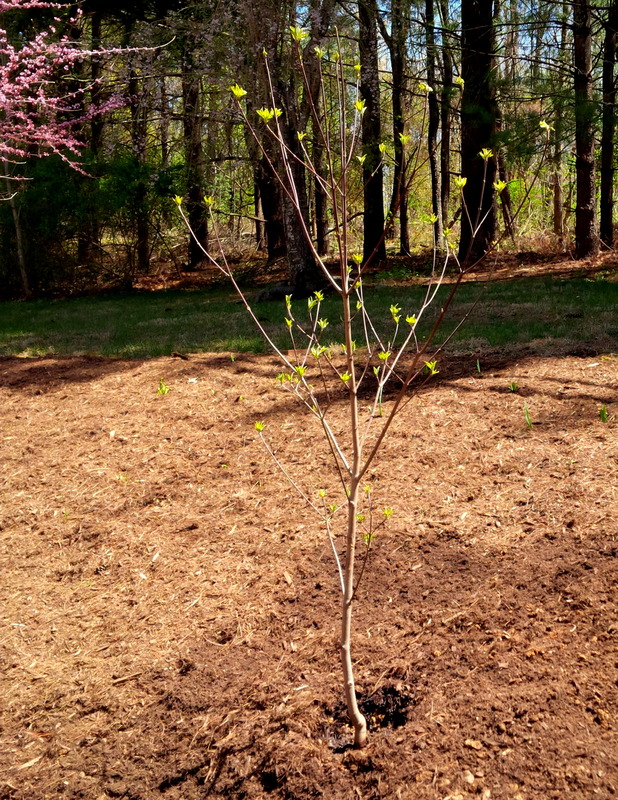 5 years ago, I planted a Crepe Myrtle and while the tree is very healthy, it doesn’t bloom as often as I hoped it would – my fault for choosing a place with not quite enough sun. I’ll look forward to seeing them. I guess it’s too late to transplant the Crepe Myrtle to a sunnier spot. That’s too bad. Our neighbor’s planted one between our houses, so we get to enjoy it too. Your yard and surrounding woods sound glorious. Yay!! Spring is a good six months away for me – I am happily embracing our advancing Wintery weather, with cooler mornings definitely on the agenda. 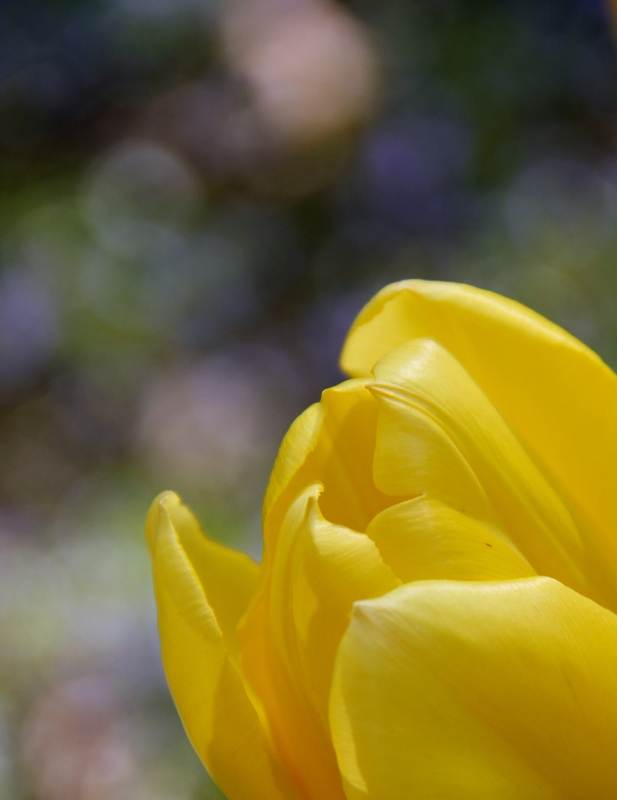 I love the fragile and tender aspect of your first tulip photo. And the phone photo of your dogwood would be classed by me as one of my better shots 🙂 Embrace away Laurie – have a wonderful and joyous spring season!! Don’t you love a cool morning? Especially when you’ve been living in terribly hot weather. I love tulips. And sunny, yellow ones are just the best. I agree! The yellow ones bring a spontaneous smile to the face, right? Beautiful pictures. . . It was a long winter, and spring seems really special this year. Happy Spring to you! I’m thrilled it has finally arrived here in NoVA.